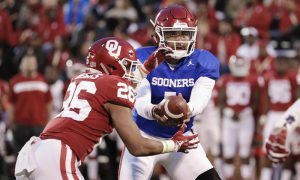 Spring football is over and we now all begin the countdown to the Big 12 Media Days, Fall Camps, and then, yes, the start of the 2018 college football season. 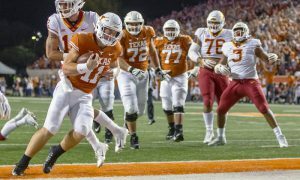 So, with that being said, let’s have some fun and look at the best-case and worst-case scenarios for every team in the Big 12 conference. We will start rolling these out throughout the month of May. Agree? Disagree? Don’t be afraid to let us know in the comments below! Let’s now move on to the TCU Horned Frogs, who are are coming off an 11-3 season, including going 7-2 in Big 12 play and a second-place finish. 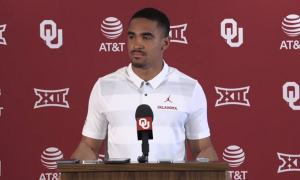 But, lots of key players are gone such as QB Kenny Hill, RB Kyle Hicks, OLs Matt Pryor and Austin Schlottman, DE Mat Boesen, DB Ranthony Texada and plenty more. 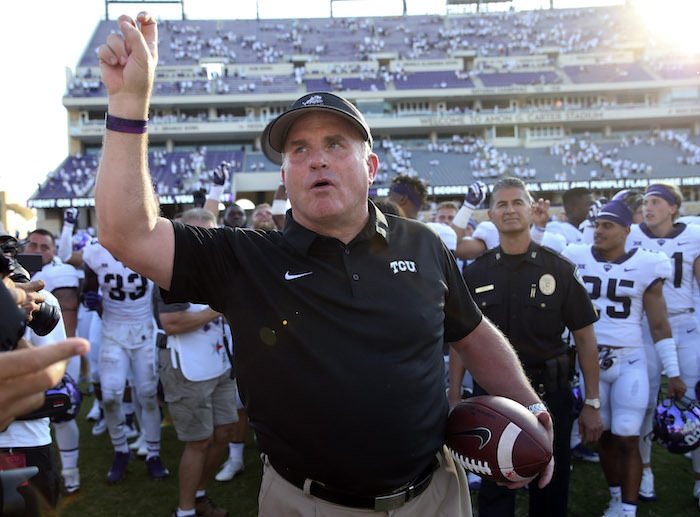 So it’s time to turn the page to the Shawn Robinson era and see if Gary Patterson’s improving recruiting classes can fill several voids. 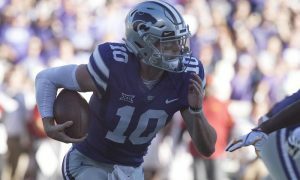 Well, it’s all about the quarterback in the Big 12, and while Kenny Hill was serviceable, he never became that top-tier QB many predicted when he was a five-star recruit in high school. Shawn Robinson replaces Hill, and in many ways, makes fans forget about him. Robinson has better wheels than Hill and his offseason improvement in the passing game gives TCU the best dual-threat QB in the Big 12 Conference. The offensive line reloads itself and the 1-2 punch of Darius Anderson and Sewo Olonilua becomes the best running back combo in the Big 12. Meantime, Jalen Reagor builds on an awesome freshman season and turns himself into one of the top wide receivers in the conference. 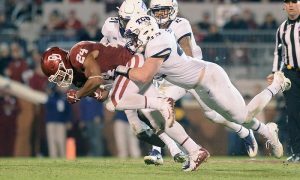 Defensively, Ben Banogu’s decision to come back for another season earns him Big 12 Defensive Player of the Year honors and linebacker Ty Summers becomes the senior leader of the unit, plus NIU transfer Jawuan Johnson is the best defensive transfer addition in the conference and helps the Horned Frogs pick up where they left off last season as the best scoring defense in the Big 12. The Horned Frogs cap off a non-conference slate at 3-0 with a win over “the” (douchebags) Ohio State University in their backyard at AT&T Stadium. TCU opens conference play at 3-0, beating Texas in Austin, giving TCU its best-ever five-game winning streak over the Longhorns, then it’s wins over Iowa State and Texas Tech at home. Following nine days off, the schedule toughens up with Oklahoma, Kansas, Kansas State and West Virginia. If the Horned Frogs get through that stretch at 3-1, that’s a massive success. Then it’s two wins to close the season against Baylor and Oklahoma State, putting the Horned Frogs at 11-1 and another trip to the Big 12 Championship Game. Sometimes, you don’t know what you’ve got til it’s gone. Kenny Hill wasn’t Baker Mayfield, but you could win a lot of games with him as your quarterback. TCU turns the page to Shawn Robinson, who simply doesn’t possess the passing game to keep defenses honest. Horned Frogs fans start counting down to the Justin Rogers era, who is rehabbing a knee injury from high school. The coaching staff decides to play it safe and redshirt Rogers in 2018, meaning Robinson is in charge, but he can’t handle the full-time job. Some key pieces on the offensive line like Pryor and Schlottman are sorely missed and because the passing game isn’t consistent, Darius Anderson and Sewo Olonilua can’t get it going like expected on the ground. 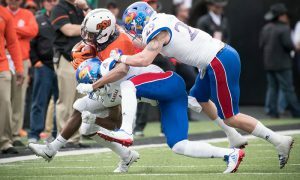 Meantime, the amount of defensive experience missing puts too much pressure on Ben Banogu, who now becomes the entire focus for opposing offensive lines, and the secondary, which loses leaders like Ranthony Texada and Nick Orr can’t duplicate last season’s team which ranked first in the Big 12 Conference in pass defense efficiency. The Horned Frogs start off 2-0 against Southern and SMU, but a rude awakening comes when Ohio State pounds the Horned Frogs and exposes lots of holes on both sides of the ball. The Horned Frogs then go to Austin where the Longhorns snap a four-game losing streak against their in-state conference foes. At 2-2, a chance at revenge from last season against Iowa State comes up short, followed by a win over Texas Tech at home. The Horned Frogs are 3-3 heading into a home match against the Sooners, who take care of business, just like they did twice last season with relative ease. 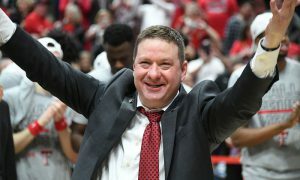 A win over Kansas is followed up by a split of four games against Kansas State, West Virginia, Baylor and Oklahoma State. 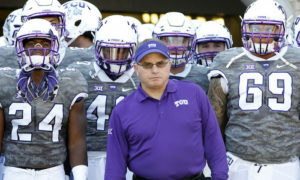 And just like that, Gary Patterson’s team is lucky to make a bowl game finishing the 2018 season with a 6-6 record.